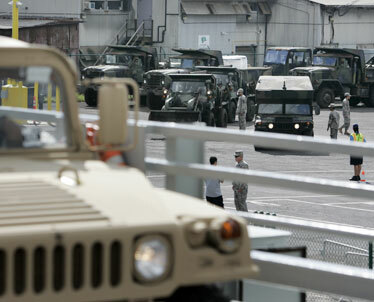 Hawaii National Guard members prepared to load vehicles onto the Hawaii Superferry yesterday for transport to Maui, where the Guard will help with storm cleanup. The Hawaii National Guard is testing out its newest method of transportation today -- the Hawaii Superferry. "It's a guinea pig for us," said Sgt. 1st Class Ian Ross. "As long as we don't have any rough weather." Twenty-four pieces of Hawaii Army National Guard heavy engineering equipment are shipping to Maui to remove debris left behind from thunderstorms and flash floods last month. The Guard loaded the equipment yesterday and will leave Oahu at 6:30 a.m.
Twenty members of the 29th Brigade Special Troops Battalion, Company A, will join 29 Guard members on Maui for the mission, which is expected to end Jan. 31. It is the first time the military has used the ferry to transport heavy machinery, and Superferry officials say it underscores the value of the vessel. "All along, we've planned that this ship can be a real asset to civil defense at a time of disaster," said Terry O'Halloran, Superferry's director of business and development. The Superferry's cooperation with the military comes days after Maui Mayor Charmaine Tavares expressed disappointment that the Superferry was adding a second daily trip to Maui without consulting community members. "It continues to be a contentious matter for many in our community," Tavares said in a statement. 1st Lt. Brian Ouimet, task force commander, said the Superferry was helping the Guard complete this mission more quickly. "It's expedient and cost-effective," he said. While the military can use aircraft to transport equipment, Ouimet said that would have cost more and taken more time to schedule. "It's still wintertime," he said. "If that debris isn't moved, there's still that risk." Ross also sees the Superferry as a benefit for the military. "When you need to get specific equipment to the islands, this (Superferry) is the fastest way to do it," he said. "It's a way to put men and equipment the same day within hours on the job. It's a great tool." Their mission is in response to the flash flooding on Maui the first week of December. Maui County officials estimated the storm caused $1.2 million in damage to the island, destroyed three homes and damaged 125 properties. A flash flood washed away a house in Waiohuli. The team of 49 National Guard members will remove logs and other debris from stream banks and reconstruct stream paths to reduce blockages in the future. "All that debris came down from the top of Kula, and the water overflowed the (Kula) Highway and got into homes," said Ross, readiness noncommissioned officer of Company A. He said rainwater cut 15- to 20-foot gullies into the stream beds that need to be reconstructed. High water pushed debris up onto banks that could clog streams again in heavy rains.